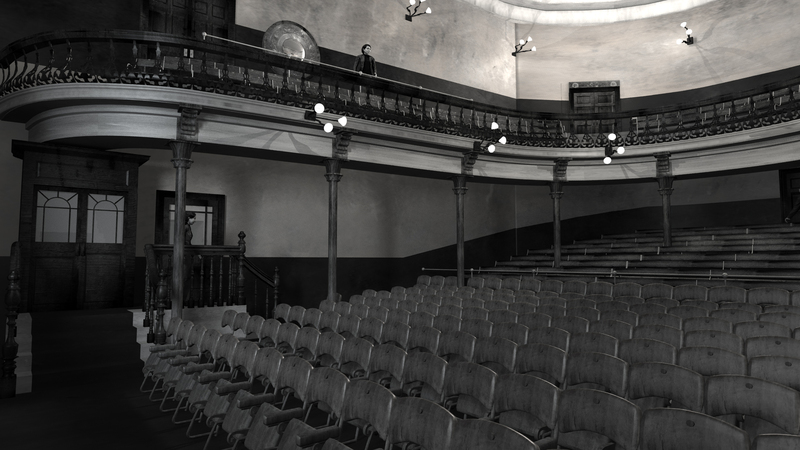 Here are images of the digital model, by Hugh Denard (research) and Niall Ó hOisín / Noho (modelling), showing the old Abbey Theatre as it appeared on 27th December 1904. 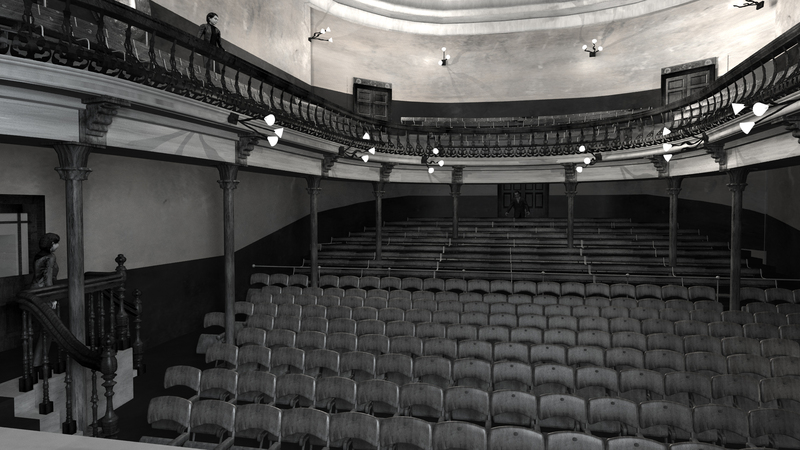 We know that the theatre was painted, in 1904, by Marks Bros, Painting Contractors and Decorators of 13 South Anne Street, Dublin, and had carpets supplied by Millar & Beatty Ltd, Artistic House Furnishers of 14 Grafton Street and 56 Dawson Street. However, we haven’t yet been able definitively to discover the original colour-schemes used. 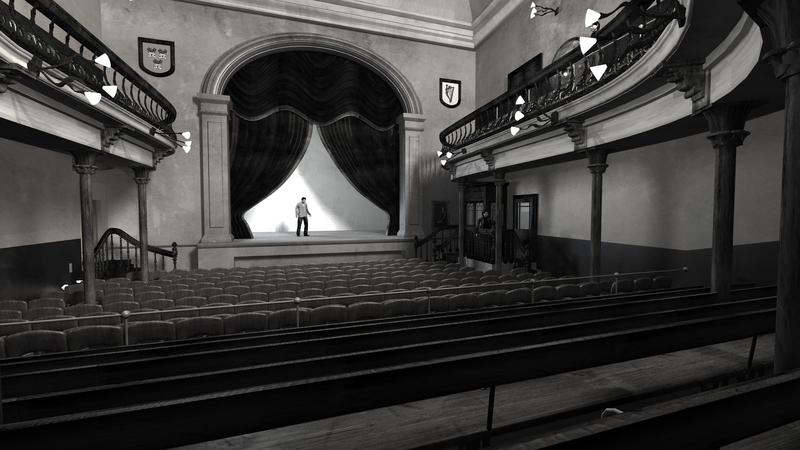 For that reason we’ve chosen to render these images in the style of black-and-white photographs. In the Balcony area, you can see the door through which patrons entered and, beside it, the circular copper-framed mirror from Youghal, which survived the fire of 1951 and is still in use in the Foyer of the new Abbey Theatre. 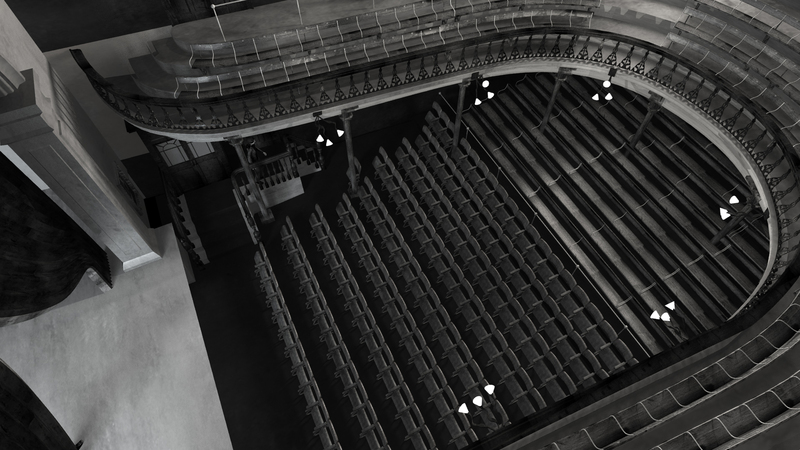 Patrons with seats in the Stalls – the most expensive seats – entered the theatre through the new Vestibule on Marlborough Street (where the entrance to the modern Abbey is situated today), and proceeded from there, down a steep staircase, to the double-doors seen to the left of the above image. The single door slightly to their right was the entrance to the ladies’ lavatory. Those seated in the Balcony – the next most costly tickets – also entered through the new Vestibule. The programme for the opening night of the old Abbey Theatre, on 27 December 1904, records: “The Upholstering and Seating of this theatre has been done by James Hill, 10, 11 & 12 Bachelor’s Walk.” The image above shows the difference between the upholstered, tip-up seats in the ‘Stalls’ at the front of the auditorium, and the long wooden benches behind them (and separated from them by a metal railing), in the so-called ‘Pit’. Above them, audience-members in the Balcony were also seated on wooden benches, but with each seat individually demarcated by thin metal armrests. 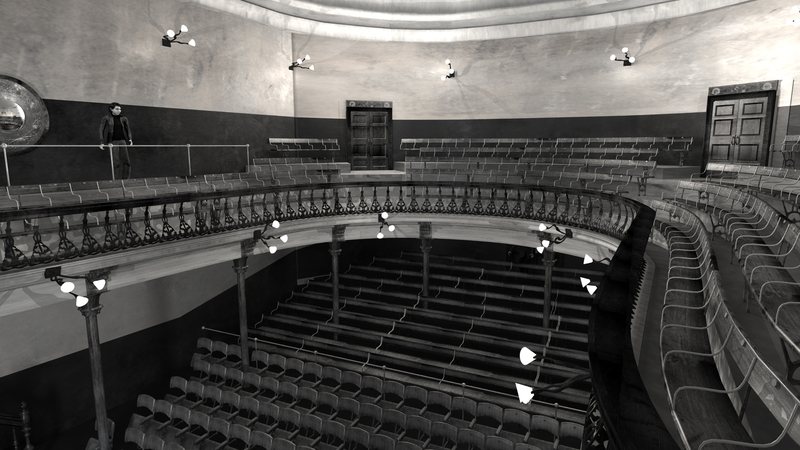 After the performance, the Balcony audience exited, not through the Marlborough Street Vestibule through which they had entered, but through two double-doors to the rear of the Balcony onto Lower Abbey Street. The theatre was lit by electrical lighting, installed in 1904 by T. J. Sheehan, Electrical Engineer & Contractor of 68 Dame Street. J. & C. McGloughlin, Ltd, Dublin, Art Metal Workers and Constructional Engineers, were responsible for the fireproof curtain, as well as the elegant external cast-iron and glass porch for the Vestibule on Marlborough Street and for the considerably plainer version, to Holloway’s design, for the ‘Pit’ entrance on Lower Abbey Street. This model, which was officially launched by Trinity’s Provost, Dr John Hegarty, on 15th April 2011, could not have been produced without the generosity and imagination of numerous sponsors and supporters, to whom we are deeply indebted. As a result, we feel that the model truly ‘belongs’ to all who have supported its creation, as well as everyone who remembers or cares about the old Abbey Theatre. For that reason, we invite everyone freely to distribute, reproduce and use these images, without fee or permission, asking only that, where possible, Hugh Denard and Noho be acknowledged as having created them. Print-quality versions are available by clicking on the above images, or you can download this PowerPoint presentation (Format: MS PowerPoint 1997-2003 (.ppt); File-size: 6.42 MB). We would also love to hear from you if you’re using or re-publishing these images. 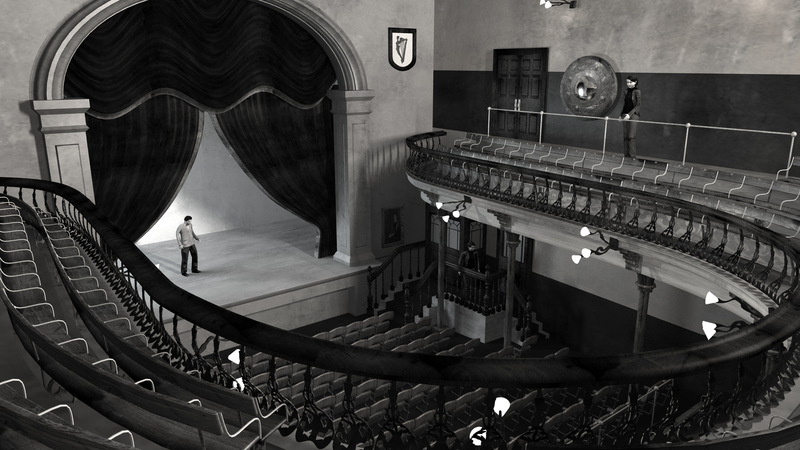 In addition to the very considerable pleasure of seeing others enjoy the model, evidence of its value and interest to a wider audience will also help us to find support for research on other areas, and phases, of the theatre. Congratulations. An impressive and most enjoyable production.